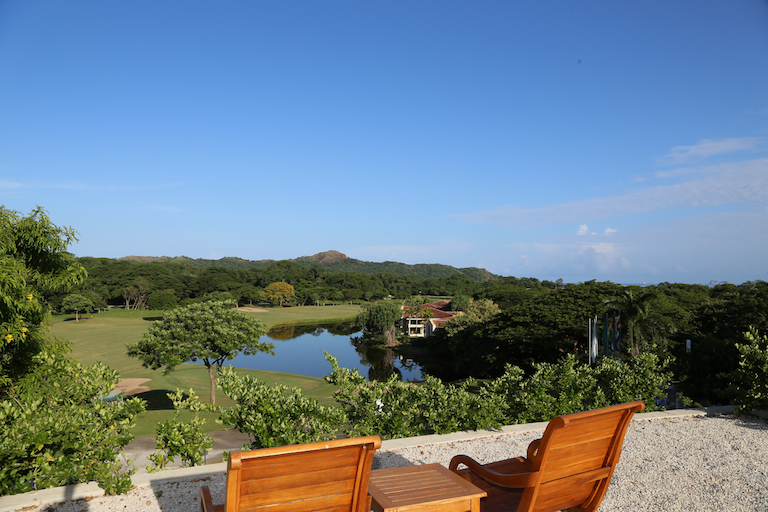 One of the best reasons to live in the Papagayo area of Guanacaste is because we have 335 days a year of awesome weather, with only October being our one wet month. As you golf these incredible courses, you are also fortunate to be surrounded by nature and wildlife; mountains, and oceans. 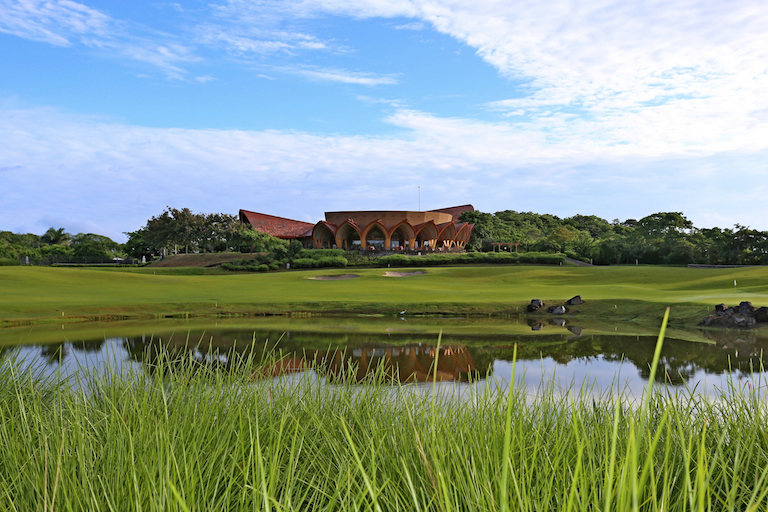 What’s cooler than seeing dozens of monkeys and hundreds of species of birds and plant life, while whacking a ball down the fairway, looking out at the Pacific Ocean? Its 88 degrees, not a cloud in the sky and the cocktails are cold. What is also appealing is that there are hundreds of other activities to do, all within one hour of the beach. So even if members of your family aren’t as addicted as you are to golf, they can keep themselves entertained. Whitewater rafting, surfing, scuba, snorkeling, hiking, volcanoes, mud baths, hot springs, fishing, sailing, kayaking, zip lining, wildlife preserves, crocodile rivers, horseback riding and the most eco-tourism in the world, will keep everybody satisfied. 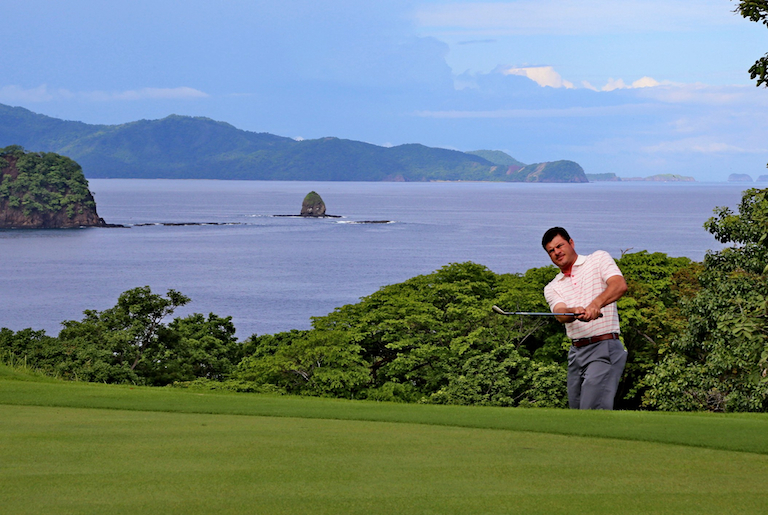 There are currently 3 championship courses within one hour of Playas del Coco, Playa Hermosa and the Papagayo region. There are plans for 4 more on the table and a renovation project in place for one of the local public courses. So it is fair to say that by the end of this decade you should be able to golf in Costa Rica on a different course every day if you so choose. So grab your clubs and come on down. But bring some extra balls and clothes, because, like most of us, you won’t want to leave. 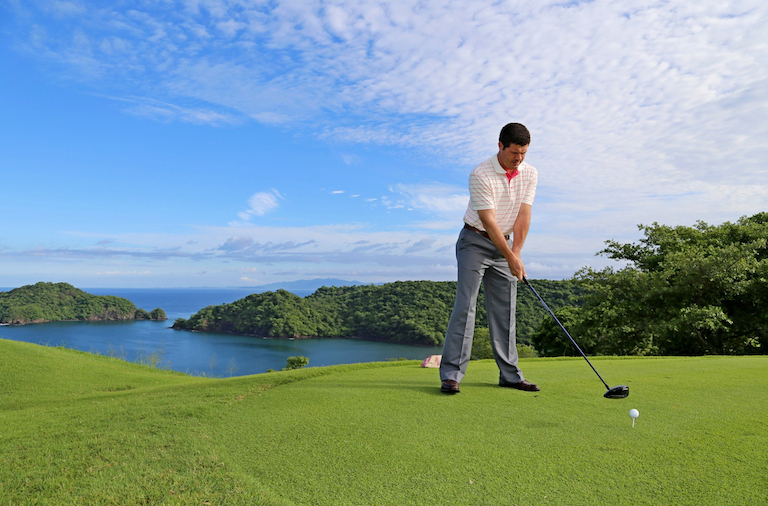 Guanacaste’s Championship Golf Courses also happen to be the top rated Golf Courses in all of Costa Rica. All three Courses are within an hour of the Liberia International Airport and our Beach area of Playa Hermosa, Playas del Coco, Playa Panama and Ocotal. 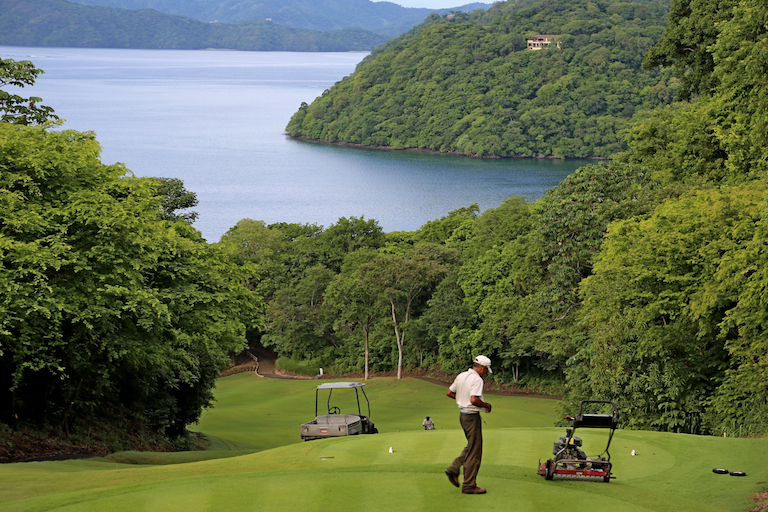 The Crown Jewel is the Arnold Palmer Signature Course at Peninsula Papagayo Four Seasons. This course ranks in the top 20 courses in the world according to Travel and Leisure and is One of the “Best 100 Courses Outside the United States” by Golf Digest. A golfer’s paradise, this 6,788 yard championship course straddles the unmatched beauty of the Peninsula Papagayo and doubles as a certified Audubon Cooperative Sanctuary. 14 holes offer spectacular views of the ocean. This captivating 18-hole Arnold Palmer Signature Golf Course is his first venture in Costa Rica and in all of Latin America. 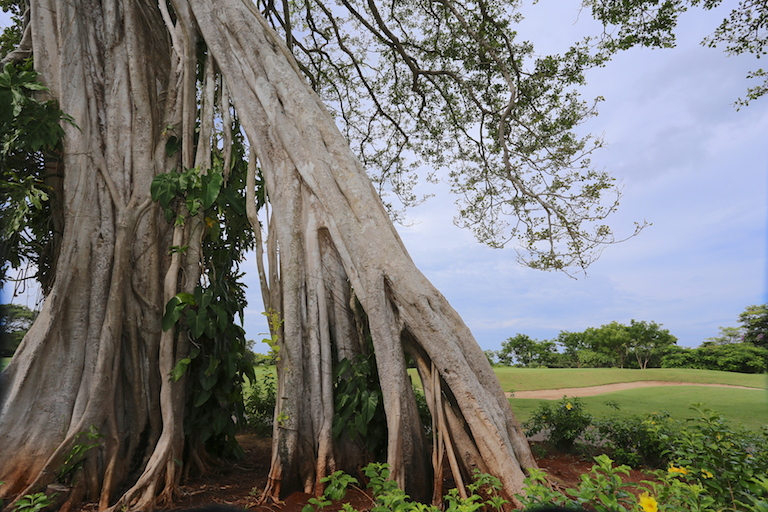 Hugging diverse terrain borne of an ancient lava flow from distant Rincón de la Vieja, the holes wind their way through 125 acres of undulating fairways and greens. Without a doubt, the Arnold Palmer design at the Four Seasons Costa Rica at Peninsula Papagayo is the crown jewel and the No. 1 golf course in Costa Rica. It sits atop one of the highest plateaus at Peninsula Papagayo, overlooking Bahia Culebra, and provides spectacular views of the Pacific Ocean on 14 of the 18 holes. Natural elevation changes create unforgettable holes, including a nice mix of long par 4s with short tricky ones. Perhaps the most dramatic hole has to be par 4 Number 6 with a 200–foot drop to a valley–shaped fairway. The course plays 6,788 yards from the championship tees, but is accessible to golfers of all levels with four other tees, including the forward tees at only 4,880 yards. The course used to be open to hotel guests only, but now tee times can be had based on availability. 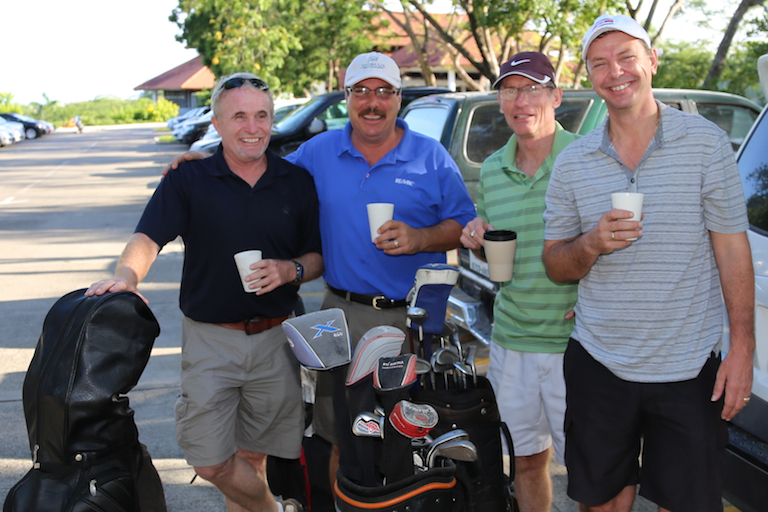 18 Holes – $230 includes a practice range, cart, and water. Clubs and Golf Shoes are available for rent. After 12:30 the greens fee for 18 holes is $165. Kids get a break as well. 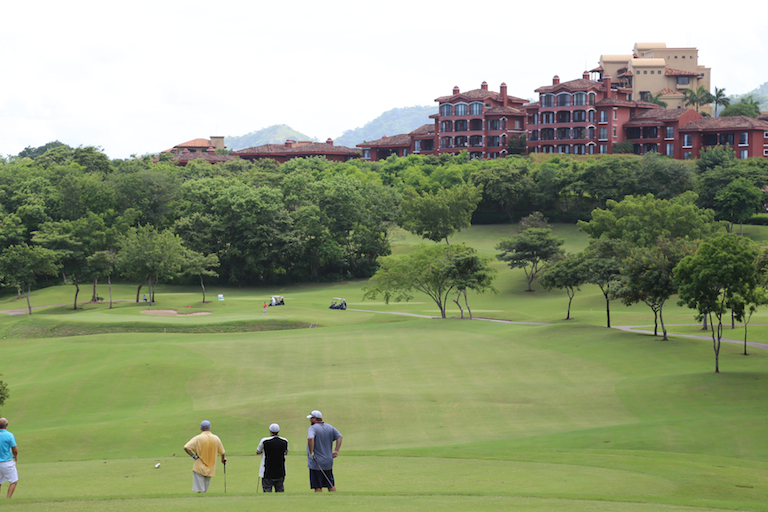 If you want to play non-stop golf for 7 days while you are a guest of the hotel it is $495 for unlimited play. 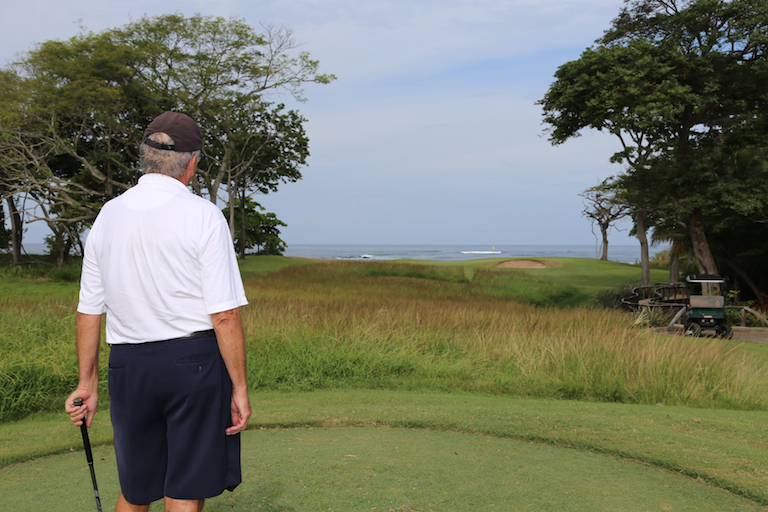 The oldest of Guanacaste Championship courses, this 18-hole golf course – meticulously designed by the legendary Robert Trent Jones II – delivers sheer relaxation and spectacular fun for golfers of all levels. Whether you’ve never picked up a club or your handicap is in the single digits, this world-class golf course guarantees a fantastic round for everyone. 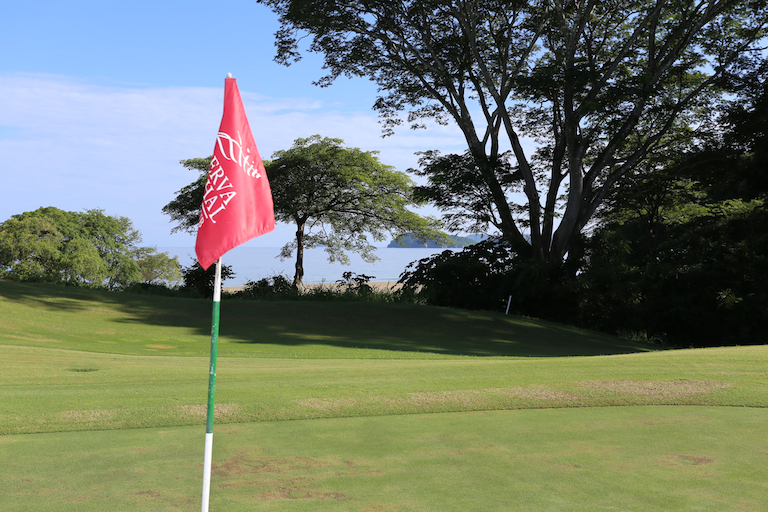 Bathed in the luscious greens and striking blues of the Pacific Ocean, the scenery of the course is enough to keep you entertained. 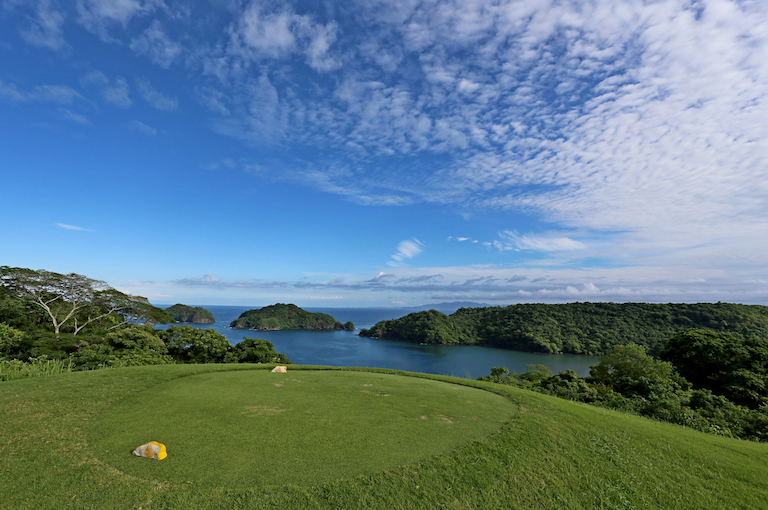 Aside from the captivating surroundings, the 6,956-yard, par-71 championship golf course is the second best rated in Costa Rica and consistently rates high among golf courses south of the US Border. 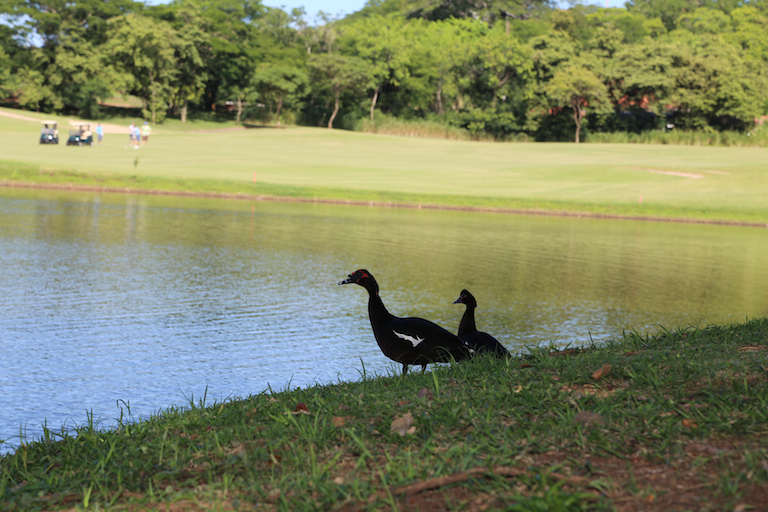 Since its inauguration in 1996, the course has provided golf aficionados with an extraordinary eco-golf experience and was the first in Costa Rica to be certified by Audubon International for the Audubon Cooperative Sanctuary Program for its environmentally friendly efforts. 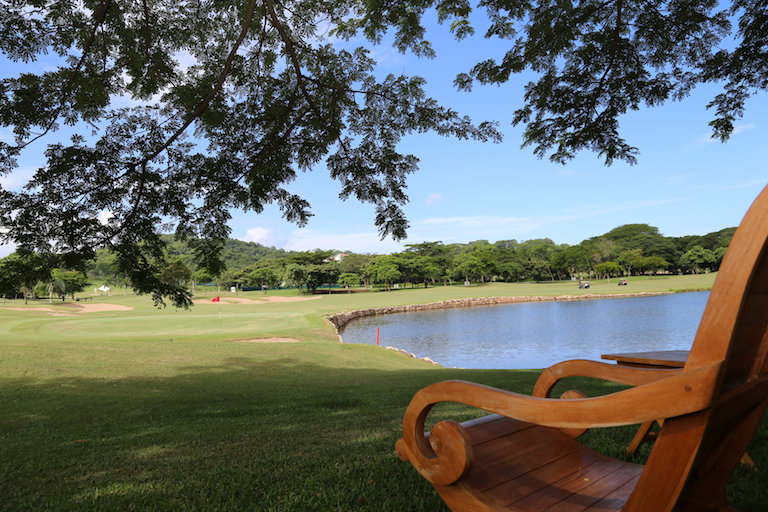 Characteristic features of the course include unique elevations from tee to green, fairways protected by sand traps and lakes, and lush forests surrounding the greens. Past players of note include Jasper Parnevick, David Leadbetter, Hale Irwin, and more. The 320-yard opening hole features a fairway devoid of hazards. While long hitters might be tempted to use their drivers, a ravine fronting the shallow green rewards caution – possibly a long iron followed by a wedge into the green. On the 542-yard seventh, tee shots must carry a cluster of trees on the left side of the fairway to offer any chance of reaching the green in two. Careful players can bail out to the right off the tee, but 13 bunkers will discourage their aspirations for par. Rounds conclude with a fabulous trio of finishing holes. Number 16, a 554-yard par five, features a downhill tee shot and a sweeping, panoramic Pacific Ocean view. This hole is characterized by a wide, undulating fairway that offers a variety of strategic options for the approach shot. Number 17 presents a stout 212-yard downhill par three that plays out of a chute of native jungle canopy to a three-tiered green fronted by water. Finally, number 18 caps a wonderful round with a risk/reward par five of 547 yards. Water guards the entire left side. A drive that lands close to the water offer a chance to hit a heroic second shot at a green that will receive a low-running draw. First-time golfers are encouraged to check the yardage book before teeing off and play very conservatively. Above all enjoy the views, the surrounding nature and have fun with your game! Take your time and soak in the forest and wildlife around you. Golf is open to the public with a regular 18 holes costing $180 including the cart. There are twilight prices as well. If you are a local diehard you can purchase a 6-month membership for $4,500 or a yearly membership for $6,000. For those of you fortunate to have golfed on the famed links courses in Scotland then you will love this course – except you will never have to bring your foul weather golf gear and you will be able to take a refreshing dip in the ocean afterward without getting hypothermia. The Golf Course at Hacienda Pinilla offers one of the finest settings for links-style golf enjoyment in a country renowned for its golf tradition. Created by respected architect Mike Young, the layout conforms gracefully to the natural flow of the land, weaving through the tropical forest along the shores of the Pacific to provide an unparalleled blue water backdrop. 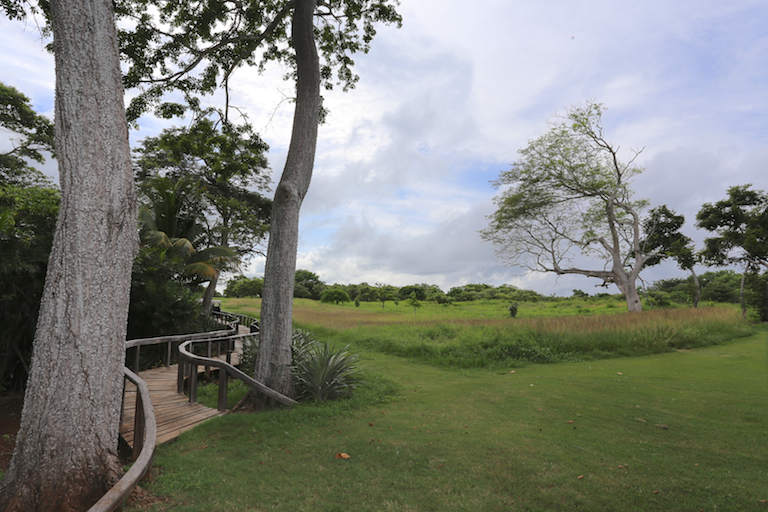 This par 72 course, which can play up to 7,200 yards, was designed to enhance the natural landscape of Hacienda Pinilla, giving golfers an exceptional and immaculately conditioned place to enjoy a round with family and friends. 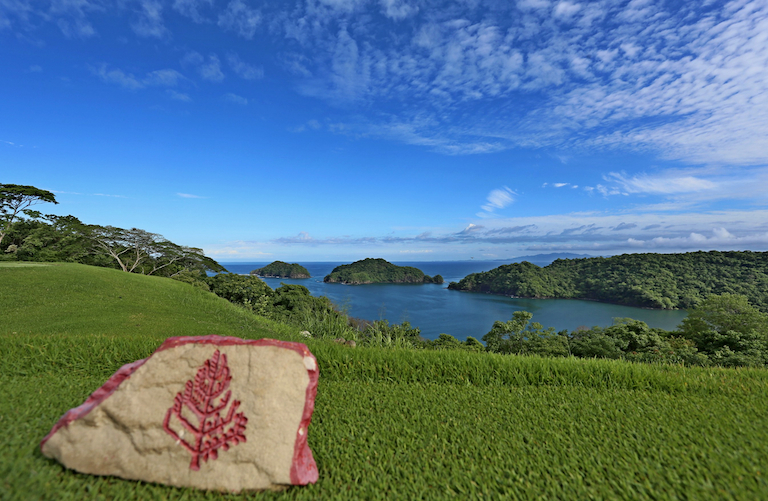 An Authentic Costa Rica Golf Course that Pairs Environmental Respect with a Love for the Game reflecting respect for its natural setting, the Golf Course at Hacienda Pinilla has earned designation as an Audubon Cooperative Sanctuary for its preservation of ecological balance. Here you have the extraordinary opportunity to enjoy your game in the natural habitats of Costa Rica, where the surrounding beauty and glimpses of exotic wildlife create a truly special experience. As an Audubon Cooperative Sanctuary, this award-winning golf course upholds the highest standards of course design, maintenance and environmental preservation. 18 Holes normally costs $150 including the cart and practice facilities. If you are a Resident of Costa Rica you pay $85 for 18 holes and an extra $20 if you need a cart. A monthly pass costs $300 and a yearly pass is $3,000. There is also an option to buy 50 rounds of golf that can be used by you and/or your friends and family for $2,500 which works out to $50 a round of 18.